The Lasallian Formation and Mission Department (LFMD), in fidelity to St. John Baptist De La Salle’s inspiration, commit to assuring the vitality and continuity of the Founder’s mission in DLSZ community by providing a genuine formation to all its members, especially to the students entrusted to our care. Through the process of Lasallian Formation and other formative programs, the department hopes to enable the students and Lasallian Partners, including the parents and alumni and other stakeholders to acquire the vision, values, attitudes and practices that support the development and strengthening of Lasallian Identity. Intentional collaborative efforts for integration are being done with Christian Living for recollection-retreat-outreach; while with the rest of the subjects for the Alternative Learning Experience. There are five units under the Lasallian Formation and Mission Department (LFMD) which implement and realize this direction. These units implement co-curricular and extra curricular programs and activities for the students that intentionally underscore the three Lasallian Core Values of Faith, Service & Communion. These programs complement, supplement and enrich the curricular offerings for the students. The Campus Ministry Office (CMO) aims to promote spiritual and religious experience; and nourishment among members of the school community, especially the students. It is created to organize and maintain a faith nurturing environment to help individuals in the community become more fully human and more fully Lasallian. Provide an extensive pool of information, functional facilities and other resources for the utilization of the community with the conscious effort to use them wisely, maximally, with care and respect. SAMBA Liturgy aims to nurture the faith of the individual in the community through liturgical activities such as providing spiritual nourishment through the celebration of the (a) Holy Eucharist –daily class mass, batch mass, Sacred Heart Mass Devotion every Friday and recollection mass; (b) Sacrament of Reconciliation –during recollection and retreat season, before receiving sacrament of confirmation and first holy communion; (c) First Holy Communion for the Grade 3 pupils and Sacrament of Confirmation for the Grade 7 pupils. It also provides the community with the opportunity to join in the celebration and experience of Christmas through the opening of the season in LUMINARE, in the reflection of the birth of Christ. BINHI Grade School Program is a developmental formation program given to Grade 4 to 7 students which aims to develop faith-centered Lasallians who put their faith in action in their everyday lives. PAGPUNLA Recollection helps the grade 3 pupils realize the beauty of their life and allows them to appreciate the spirit of friendship, equality and mutual sharing with the family. PAGSIBOL Recollection allows the grade 4 pupils know and share their goodness and giftedness to others and also appreciate the good that other peole have as well. PAGYABONG Recollection gives grade 5 pupils the opportunity to become aware of the value of being responsible brothers or sisters to people. PAGSUHAY Retreat aims to equip the grade 6 pupils with decision-making skills anchored in faith. It also aids in letting them realize the value of family as guardians. PAGBUNGA Overnight Retreat lets the grade 7 pupils appreciate the Lasallian faith and zeal and makes them understand the importance of practicing these in the family, school and the community. LAKBAY High School Program is a developmental series of Recollection and Retreats for Grade 7 to Fourth Year students. It is designed to complement and supplement the Lasallian Formation that the school is providing. The KAPATIRAN Recollection (G8/G9) is a whole day activity that dwells on community building through processing of the individual’s relationship with one’s self, others, and God. The recollection reflects on St. De La Salle’s sense of community and on Jesus’ calling the first disciples—with the way His followers gathered and formed their first communities and established a strong sense of belongingness. The KAISA Recollection (Sophomore) aims to deepen further the Christian Values, substantiated through the Lasallian Values, instilled in them. It further aims to actualize one’s sense of compassion and bear witness the role of the church in the community. The KAWANGIS Retreat (Juniors) emphasizes on the role of each member as representative of Christ to the community where they belong and being aware of the larger community that surrounds them –the society. It helps assess the students’ personal values and direct themselves to a deeper understanding of the social realities in relation to truth, justice, human rights and integrity of work. The KAUGAT Retreat (Seniors) is a 3-day live-in activity that assesses one’s growth as a Lasallian. The retreat reflects on St. John Baptist De La Salle’s living tradition and heritage, Lasallian values and spirituality vis-à-vis Jesus’ institution of the Holy Eucharist. It aims to exhibit a sense of ownership of the Lasallian Spirituality in one’s chosen vocation and service to others inspired by the Lasallian tradition of faith and zeal. The LASALLIAN CONGRESS (per batch) is a program designed to tap, train, and form students to become leaders. The students come from all walks of life and of different personalities and behavior. It aims to empower students to become future leaders as it provides a venue for students to learn and live the concept of being a true Lasallian leader through prayer, group dynamics, and outreach activities. LAKBAY FORMATION PROGRAM re-affirm the presence and importance of the Lasallian Spirit and Mission by providing us spiritual activities and exercises that will give way for a proper guidance and direction. It also helps in recalibrating the Lasallian partners to fully fit so as to proceed with Lasallian journey, through GALILEE EXPERIENCE (for Employee on their 1st Year – EY1), EMMAUS EXPERIENCE (for Employee on their 2nd Year – EY2), and CENACLE EXPERIENCE (for Employee on their 3rd Year – EY3), formations. BUKLOD FORMATION PROGRAM re-enforces the Lasallian Spirit and Mission by gathering together in prayer, reflection and faith sharing so us to help sustain the fire of the Lasallian Spirit and enflame the drive within us to act out the Lasallian Mission in everyday life, through STAR SESSIONS; community reflections: PAGTATAYA-Formation at the start of the year, PAGMUMUNI – Advent Reflection, PAGNINILAY-Lenten Reflection; LS MENTORS’ RETREAT; and LASALLIAN REFLECTIONS. UGNAYAN FORMATION PROGRAM is designed to help the DLSZ formators to also be formed both as a person and as someone who will be an instrument in forming others, to equip and prepare themselves in assisting and giving formation to those who travels with them. This is done through BEING CALLED; BEING FORMED I-III; and BEING SENT SESSIONS AND WORKSHOPS. AGAPAY FORMATION PROGRAM focuses on some of members of the community with a particular concern. Having a particular group somehow helps one to be oneself without any reservations, and may be able to express one freely. This is done through CROSSROADS (pre-midlife); MIDLIFE SPIRITUALITY; GIFT OF YEARS/ SPIRITUALITY FOR THE GOLDEN YEARS (post-Midlife/ Retirees); and ASCENT. The TANGLAW FORMATION PROGRAM caters to the other members of the community who are there at the background but actively adds growth to DLSZ community. This is done through RECOLLECTION/ RETREAT/ FORMATION for other Lasallian Community and Community Partners, Parents, Alumni and Agency Hired Employees. Lasallian Formation for Parents cater to strengthen the Family – School Partnership to deepen the role of parents in the Lasallian Education of their children. The Social Action Office (SAO) aims to collaboratively work with the Lasallian community for translating into action the knowledge gained in the classroom and developing the learner’s zeal for service through discovering, experiencing and witnessing the life of the children, youth-at-risk, vulnerable and other marginalized sectors in the community. Provide a holistic and relevant formation integrated in the curriculum that fosters strong socio-civic responsibility and solidarity with the poor, especially to the youth at risk. Ensure programs that are socially –environmentally responsive, culturally appreciative, religiously undiscriminating and gender sensitive geared towards empowerment & development of the children and the youth. Build partnership and strong linkages with people organizations, government and non-government organizations, church, schools and other organizations that share a common conviction for children and youth at risk. 2. TUGON Volunteers (Zobelunteers). Tugon is a Filipino concept, which means “response”. Our Lasallian heritage inspired by the founder, St. John Baptist de la Salle, enjoined us to respond to the “signs of the times”. The Tugon volunteer program is DLSZ’s concrete and direct response to the needs of the children and youth at risk, the people who are victims of circumstance and marginalized by exclusion. The Student Clubs and Activities Office (SCAO) aims to promote the holistic formation of students, inspired and guided by the Christian teachings and the Lasallian Core Values taught by our founder St. John Baptist de la Salle. Develops competent and productive student services by tapping into the abundant resources of the DLSZ community through coordination with the various academic programs, and with the establishment of relationships based on partnership and shared mission with other sectors outside this community. Lasallian Leadership Empowerment And Development (LLEAD)Series 1-3. This is a formation program for Grade School and High School Student Representative Coordinating Council (SRCC), Organization Officers and Student Government officers of Br. Rafael Donato FSC Night High School which helps in establishing their goals, enhancing their leadership skills, and emphasizing the importance of responding to the needs of our society anchored on Lasallian Core Values of Faith, Communion in Mission and Zeal for Service. Extended Lasallian Leadership Empowerment And Development (E-LLEAD). This is a leadership program intended for Class Officers, Student Prefect and Lasallian Ambassadors*. It enriches their basic leadership skills which they can employ inside and outside the classroom. Club Extended Lasallian Leadership Empowerment And Development (Club E-LLEAD). This is a leadership training program designed for club officers to develop their leadership qualities based on the Lasallian Core Values for effective execution of their club activities and projects. IgNIGHTing the Spark toDAY (The Spark). This leadership training activity strengthens the relationship between the student leaders of the day school (SRCC) and the night school of BRafeNHS Student Government through discussions of best leadership practices and possible ways to foster active collaborations. Guiding Others on their Ability to Lead (G.O.A.L.). This leadership training program is designed for public /private school’s student leaders of Muntinlupa and adjacent municipalities who will be invited to undergo an enhanced leadership training and formation orchestrated by the club called M.O.V.E. (Motivate. Orient. Visualize. Excell.) of the De La Salle Santiago Zobel. Its major objective is to promulgate responsible, effective, and proactive leadership that will eventually help in the positive transformation of the society. Parents’ Expertise for Club Enrichment Activities (PECEA). Parents as one of the stakeholders and Lasallian Partners are encouraged to participate as resource speakers/ facilitators in club initiated workshops. GAWAD LUNTIAN – Lasallian Star Achievement(Club Recognition). This culminating activity aims to highlight and recognize the achievements of the club, club members, and club moderators based on the established criteria or standards. ABOT Lasalyano (Reach Out and Reach In, Lasallians!). Outreach and In-Reach activities transform the club members to be proactive, and dynamic Lasallians committed to respond wholeheartedly to the Lasallian mission and ministry. Students’ Active Participation. Students will be highly encouraged to put their knowledge and abilities to test by joining in local, national and international co-curricular contest, competitions, symposia, and for a. Club Empowerment.Club members and officers with the guidance of their moderators are empowered to initiate their own seminar/workshops. As part of the school’s educational program, ALE is conducted to enrich student’s learning and life experience. It is exclusive to the students and school personnel. The Subject Teachers are enjoined to integrate their subject matter with the activities that they will conduct during ALE. The students are highly encouraged to participate in this activity with their parents’ consent as manifested in a signed parental approval form. Each student participates in an organization to the extent that his/her scholastic standing will allow. The Student Representative Coordinating Council (SRCC) as the supreme student organization of DLSZ promotes the welfare of the students and works for the proper coordination of student activities with the faculty and administration. The Young Observer is the official publication of the grade school students. The Counterpoint, on the other hand, is published by the high school students as their official school paper. The Yearbook is the annual publication that features the graduates and undergraduates of the school. The annual issue also includes photos of significant events and accomplishments for the school year. Note: Students who are bona fide members of SRCC and the Student Publications may still opt to join other organizations provided they do not hold key positions in these organizations. Lasalyanong Pinoy aims to live the Lasallian mission and teachings of the founder, St. John Baptist De La Salle through activities that underscore nationalism, patriotism and the Lasallian Core Values of Faith, Zeal for Service and Communion in Mission. ZOOB NEWS TV and Current Affairs aims to form responsible media producers and consumers on campus. It recognizes the integral role of Media in the lives of young people, with the aim to blend Education with an informed Media consumer and producer. The school has an extensive program for student activities. At the beginning of the academic year, students are given Club Preference Form with Club Descriptions for club activity participation. The student, with parental advice, chooses the club he/she wishes to join for the year. Clubs are categorized as Academic, Leadership and Religious, Sports, Music and Arts. The School Counseling Office (SCO) is committed to the pursuit of excellence and the formation of the whole person. It aims to provide a comprehensive, developmental School Counseling Program that will enhance the academic, personal/social and career development of the students in collaboration with the school, home and community. The outcome of the program envisions the students to become Christ-centered, productive and service-oriented members of society. Individual Inventory – This involves a systematic accumulation of meaningful information in recorded forms. These are attained through interviews, standardized test results, academic records, personal data forms and rating scales. Counseling – This is considered the heart of the school counseling center; counseling by groups or individually enables the students to discover their strengths and limitations, explore options and solutions available to a problem to make the necessary adjustments. Interviews – Interviews are conducted to gather information about the individual student. This is carried out through initial, routine, and exit interviews. Psychological Assessment – the IPA administers standardized paper and pencil or performance tests to students and teachers. The school counselors assist in the dissemination and interpretation of the test results. Consultation – This involves regular collaboration with administrators, teachers, staff, parents, and co-counselors that is held for referral, counseling and follow-up purposes. The school counselors are also in constant consultation with the administrators on related matters that require institutional and departmental decision-making. Referrals – Students requiring special attention are directed to the level counselor after consultation between counselor and parents, teachers, and/or administrators. Cases needing further intervention are referred to a psychologist, psychiatrist and/or other allied specialists. Guidance Classes – Individual abilities for leadership, decision-making, personal-psychological and social adjustment are tapped through regular group activities during guidance classes. Career guidance sessions for maximum development of potentials of students are conducted in the high school level. Information – Students avail of informational materials for a realistic background of schools/colleges/universities here and abroad, including the requirements and policies for admission and scholarships offered. A directory of available clinics and agencies is also provided for special cases. Placement – This refers to student admissions, faculty recruitment and college placement through standardized testing procedures, interviews and other relevant screening procedures. Follow-Up- Information is secured from the graduates,concerning the strengths and weaknesses of the total school program. The Cultural Affairs Office (CAO) aims to promote the holistic development of the Lasallian student through its Arts enrichment programs and activities that incorporate the values of social responsibility and cultural stewardship. 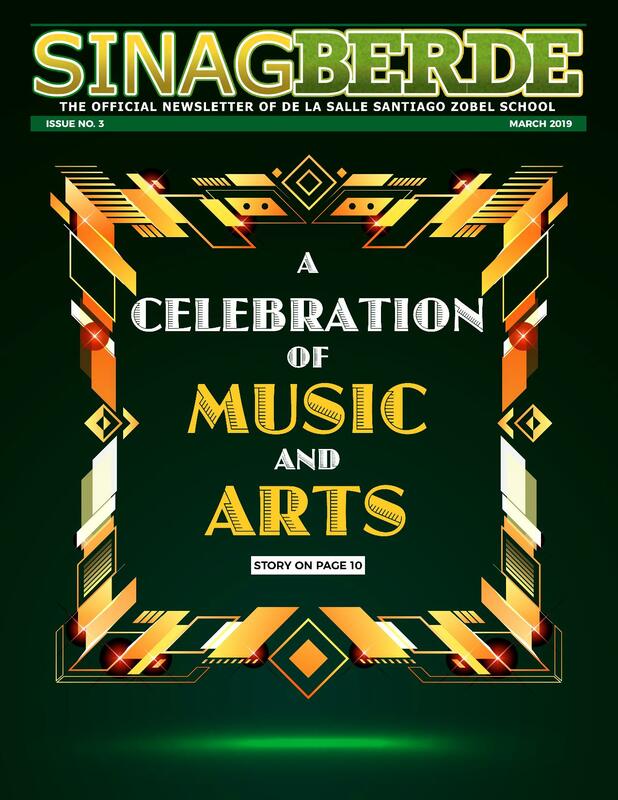 Provides the Lasallian arts enthusiasts, in particular, the opportunity to excel in the field of music, theater, dance and visual arts by providing proper training, learning experiences and exposure activities in collaboration with the Music and Art department, and in consultation with other notable artists. Artist development through mentoring programs, hosting and joining in workshops, staging of cultural shows, participating in local and international festivals and competitions and performing in special events. On-going artistic trainings and yearly activities include, but is not limited to, the Special Music Program, Special Performing Clubs, Advance Art Mentoring Program, Campus Art and Aesthetics, Institutional Concert, Spotlight Shows, Annual Musical and the Annual Gala Concert celebrated during the February Arts Month. Hosting of special activities of the school such as exhibits, recitals, concerts, cultural shows and musicals, in the Sylvia P. Lina theater, also known as the CCP of the South located in the Center for Performing Arts building. Management and development of the school’s Spark Museum envisioned to inspire young Lasallian students to develop their God-given talents in visual arts through the appreciation of the childhood artworks, as well as, the present artworks of distinguished artists. For Visual Arts, the Advance Art Club.